My main research interests is in systematics of birds, in particular sorting out taxonomic issues, investigating their evolutionary relationships and understand historical biogeography. In addition, I focus on understanding the association of avian vocalization, syringeal morphology and anatomy and phylogenetic signal. CROWE, T.M., BOWIE, R.C.K., BLOOMER, P., MANDIWANA, T.G., HEDDERSON, T.A.J., RANDI, E., PEREIRA, S.L. & WAKELING, J. 2006. Phylogenetics, biogeography and classification of, and character evolution in, gamebirds (Aves: Galliformes): effects of character exclusion, data partitioning and missing data. Cladistics 22 (6): 1-38. MANDIWANA-NEUDANI, T.G, KOPUCHIAN, C., LOUW, G., CROWE, T.M. 2011. A study of gross morphological and histological syringeal features of true francolins (Galliformes: Francolinus, Scleroptila, Peliperdix and Dendroperdix spp.) and spurfowls (Pternistis spp.) in a phylogenetic context. Ostrich 82 (2): 115-127. COHEN, C., WAKELING, J.L., MANDIWANA-NEUDANI, T.G., SANDE, E., DRANZOA, C., CROWE, T.M. & BOWIE, R.C.K. 2012. Phylogenetic affinities of evolutionarily enigmatic African galliforms: the Stone Partridge Ptilopachus petrosus and Nahan’s Francolin Francolinus nahani, and support for their sister relationship with New World quails. Ibis 154: 768-780. MANDIWANA, T.G. 2003. Taxonomy, phylogenetics and biogeographical relationships of African grassland francolins (Genus: Scleroptila). Pp. 67-68. In: Roberts Birds of Southern Africa. 7th ed. 2005 (Hockey, P.A.R., Dean, W.R.J. & Ryan, P.G., eds.). Trustees of the John Voelcker Bird Book Fund, Cape Town. MANDIWANA, T.G. & CROWE T.M. 2004. Taxonomy, phylogenetics and biogeographical relationships of African grassland francolins (Genus: Scleroptila). In Stevenson, D. Wm. Abstracts of the 22nd Annual Meeting of the Willi Hennig Society. Cladistics 20 (1): 76-100.
the diversity of vertebrates and invertebrates fauna at Tswaing Meteorite Crater. 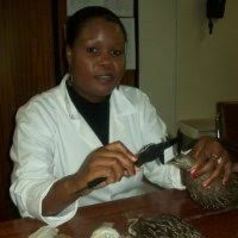 2011: NRF Final report on the Natural History Collections in South Africa. HAMER, M., RAATH, M., ROURKE, J., OLIVER, T., MANDIWANA-NEUDANI, T., MWALE, M., BARTELS, P. & MARASAS, W.
Title of final report: Collecting now to preserve the Future.